Located at the junction of busy commercial streets in an urban area -- South Street and Qingnian Road -- Nantong Huatong Hotel has superior location and convenient traffic conditions. With a novel external design and elegant decoration, it is a starred foreign-related tourism hotel. The rooms in Nantong Huatong Hotel are clean, elegant, quiet and comfortable, and are all equipped with facilities such as a magnetic room card, central air conditioner, satellite television, IDD television and mini bar. The food in the hotel is mainly Huaiyang flavor, integrating specialties of Beijing, Sichuan and Guangdong. There is also a Chinese and Western Restaurant with over ten private dining areas to create a special atmosphere for you. Nantong Huatong Hotel has complete supporting service facilities, as well as a multi-function hall that can accommodate 250 persons and five conference halls and reception halls of different sizes. It also offers a recreation center, a dance hall, a chess room, a fitness center, a snooker room, a beauty salon, KTV and an infirmary. 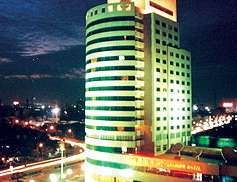 The hotel has a business center for your convenience and a unique coffee house.